In October 2015, The Wilson, Cheltenham’s Art Gallery and Museum, will be welcoming a new resident – a life size bronze Emperor Penguin. 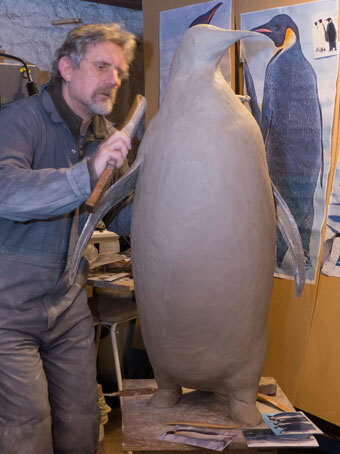 The statue, commissioned and funded by the Art Gallery and Museum Development Trust, will be positioned in the foyer to allow visitors to get up close to the penguin. The sculpture will be a first point of introduction for visitors to The Wilson. more about Dr. Edward Thomas Wilson, naturalist and founder of the museum, and his more well-known son, Dr. Edward Adrian Wilson. Dr. Edward Wilson was one of Captain Scott’s key men in the Antarctic. 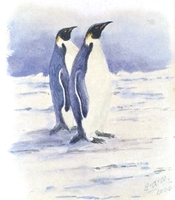 A talented doctor, illustrator and naturalist, Wilson’s observations on the two expeditions have helped to shape our understanding of polar wildlife, in particular the Emperor Penguin, the breeding habits of which were unknown until Wilson returned to the U.K from his first Antarctic trip. When he was writing the fiirst Scientific Report on the breeding habits of the Emperor Penguin, it was to his naturalist father to whom he turned for advice. Wilson made a second attempt to learn more about the breeding biology of the Emperor Penguin during Captain Scott’s second expedition, which became known as The Worst Journey in the World. Wilson’s belongings from his Antarctic adventures are now held in the museum collections at The Wilson, a venue managed by The Cheltenham Trust, and they illustrate the international importance of Wilson’s contributions to Scott’s polar explorations. Nick Bibby, the sculptor creating the work, is known internationally for creating realistic animals in bronze, and has produced works including familiar British wildlife such as his pheasant and barn owl, plus horses, cattle and other livestock, and from further afield, a rhinoceros and a life-size Kodiak brown bear, to name a few. Nick said, “I have had a fascination with penguins, and particularly emperor penguins, since early childhood. I remember seeing images of these amazing birds, huddled together in Antarctic blizzards at temperatures of -60 degrees C or even colder – how could I not be captivated?! I have long known of Edward A Wilson. The Antarctic adventures of Scott, Shackleton, Wilson, et al, and the ill-fated attempt on the South Pole by Scott, Wilson, Oates, Bowers and Evans are tales of heroism to stir any young boy’s heart. To celebrate the arrival of the penguin, The Wilson will be organising a range of themed adult and family orientated activities, including themed Tots & Tales and Arty Sunday sessions, and special museum trails about the history of Dr. Edward Adrian Wilson in the Antarctic, exploration and natural history.